Mr. and Mrs. Harry Wiess built the Stable shortly after the First World War on 76 acres of beautiful riparian forest along Buffalo Bayou. Designed by renowned Houston architect John Staub (1892-1981), the house is based on stable designs Staub saw in Virginia and across the South. It was used primarily as a weekend and summer family retreat. It housed up to ten horses, with riding as the primary recreation. In the 1950’s, Staub worked with one of the Wiess daughters, Margaret Wiess Elkins, to reduce the number of stalls and increase the useable area within the house. The Elkins family kept horses there until the early 1970’s and they continue to use the Stable, a reserve of five acres within Stablewood, for family gatherings and special celebrations. Stablewood, as we know it today, was incorporated in 1992 and developed by Walter Mischer, Sr. and Jim and Margaret Elkins, with Mark Kilkenny in charge of development of the property. 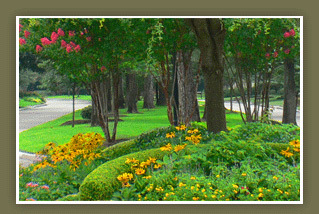 It was modeled after the tree-lined North and South Boulevards in Houston, with the distinction of being the first private, gated, guarded subdivision in the Houston area. Architects Charles Tapley and Ray Bailey collaborated in planning the streets, landscape and architectural guidelines for the homes that were to be built. The first home was constructed at 8722 Stable Crest Boulevard, and there are currently 121 homes within Stablewood. During the 1990’s, the developer turned over the management and maintenance of the subdivision to the Property Owners Association. The original horse-riding area for the Wiess family is now the location of Pasture View Lane where most of the trees had been removed for the sport. In 2002 Stablewood residents sponsored a tree project to replace and add trees on the boulevards and cul-de-sacs to restore the original feeling of a forest. The trees were donated in honor or memory of loved ones, and each tree bears a plaque at the base indicating the honoree and donor.